If you’re playing with the idea of travelling to India, don’t let another excuse stop you. Dig into those savings, grab your passport and pack a bag. This diverse country will give you everything from rich culture, to beaches, to poverty, to food that’s worth flying across the world for. I won’t forget how it happened for me. This year January, I didn’t have a clear picture of what the next phase of my life looked like. Two weeks later, friends invited me to visit the exotic country of India. It was a very spontaneous decision to which I immediately said yes. Within 24 hours I had my ticket, set up an appointment for all the required vaccinations and applied for the visa. Without much else planned in terms of logistics, this is where we wanted to go: Mumbai, Goa, Jaipur, Agra, Dehli, and back to Mumbai for our flight back home. The intention for this trip was to get to know the heart of India. This meant being saturated in its rawness, poverty, riches and foreign landscapes. I’m not going to say much on this. Applying for a visa is a pretty straightforward process and free for South Africans. I was happy to receive mine within less than a day of applying. Upon arrival in Mumbai, the queues were long and it took forever to get through customs. I do recommend having some rupees on you before making it out of the airport, as not all ATMs support South African cards. In fact, my first withdrawal attempt at the airport resulted in my cards being blocked and caused quite a bit of stress. Alternatively, if you’re traveling with someone, it’s a plus as they can bail you out. It is worth exploring and seeing which ATMs you’re able to use hassle free. With its disorderly streets and impressive architecture, Mumbai will give you everything you need from exotic cuisines, to culture, to a very interesting nightlife. If you’re planning to visit, Juhu Beach is a worth a stop. Not only does it host an exquisite night market, but there is no shortage of food. Beaches are overcrowded and it was an interesting thing to witness people swimming in their clothing instead of bathing suits. If you’re in the city, you can’t give its most iconic landmark a miss. The Gateway of India is open 24 hours a day and entrance is free. Right across from it stands the Taj Hotel, even more breathtaking than a picture can say. Mind you, your experience here may be a bit of a hassle. Be prepared to be harassed by photographers looking to take pictures of you at a fair price. This is just something one has to get used to when visiting India. It can get much, but just say no, move on and don’t try to negotiate. It will only frustrate you. To make the day even better, we explored the Elephant Caves situated on Mumbai Harbour. The caves host impressive temples and sculptures, so don’t forget to have your camera handy. We then made our way to explore the city streets. There is so much ground to cover. The place is very interesting in the way that pubs, for example, are not in the same vicinity but very spaced out. It was quite frustrating as we wanted to go pub hopping, but got more lost than pubbing. I can’t write this without mentioning a really impressive bar. The Effingut gave us a complimentary beer tasting. I enjoyed the place so much, I didn’t want to leave. The food was fantastic and a little higher priced than eating at a local restaurant (compare 495rs to 100rs). But whether you’re paying tourist or local prices, you can’t go wrong with the food. It’s just out of this world. Beer starts anywhere from 150rs, and if you’re a wine lover, be prepared to pay at least 475rs per glass. The atmosphere was inviting and there were more tourists than I witnessed anywhere else. Every vacation deserves some down time, and if you're planning to be a beach bum and de-stress, Goa should definitely make your list. With permission to show some skin, Baga Beach is the place to go, but even then only about 5% of people wore swimsuits. And as you can guess, they were tourists. I was very surprised to see some locals wear shorts here, as India is strict when it comes to revealing certain body parts. Although crowded at times, the beaches weren’t as packed as in Mumbai and were very well maintained. Whether you’re in a restaurant or lying on a recliner in the sand, there is an abundant supply of massage offers. I must admit, we lived, ate and slept Baga Beach, so I’m not ashamed that we didn’t explore much else. This was our ‘get away from the bustle’, and the hardest decision we had to make was which cocktail to order. In terms of accommodation, there are places to stay just about everywhere in Goa, and if you’re looking for a spot near the beach, you won’t struggle to find one. We stayed at the Baga Squat, which is a one minute walk from where sand meets feet. Water sports is the theme of the day, and whether you’re looking at snorkeling, jet skiing or parasailing, the activities are endless and reasonably priced. You can find anything you need here. Restaurants are less than a minute’s walk and there are pharmacies and clothing stalls at every corner. Baga is a pretty festive area and locals love their celebrations. We were right on time for this year’s Holi Festival where people don’t sleep and party all night and day. Day parties went on from 10am to 6pm and locals are not shy to throw each other with paint powder. During this time, it was interesting to see people immerse themselves in the ocean to wash the powder off their bodies as the party continued. Moving from relaxed beach life, we spent the next few days taking in as much of the Golden Triangle as possible. Many people go either New Dehli-Agra-Jaipur or Jaipur-Agra-New Dehli. Because of last minute flight increases, we ended up doing the latter. Either way, I don’t think it really matters. 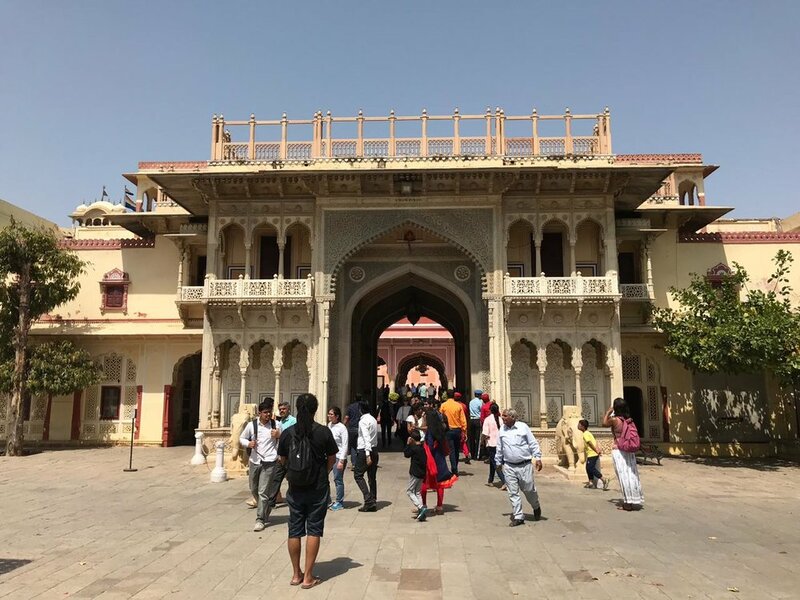 We spent two nights in Jaipur, two in Agra and one day in New Dehli. Because there is so much to see, one day is not recommended if you want to take in a decent amount of architecture. Do not be surprised if you’re approached by locals who are curious of your origin. People are not afraid to approach and ask you where you’re from. There aren’t too many tourists around, and so it’s easy to be the center of curiosity. Enjoy the connection. The Amber Palace is a major tourist attraction. Also known as Amber or Amer Fort, it has been declared a UNESCO World Heritage Site. The palace boasts a magnificent Sound and Light Show held every night both in English and Hindi, which focuses on ancient tales and the history of Jaipur. Later that evening, we went to a bar across the road and were able to see the Hindi performance from a distance. The view in itself is captivating. Agra isn’t a place people spend a lot of time in. There are, however, two musts if you’re going to spend those good dollars travelling halfway across the world. The first is Agra Fort, and the second, you guessed it: the Taj Mahal. It’s easy to underestimate the beauty of the fort when the Taj Mahal outshines it, but this mini version’s beauty is not to be underrated. Agra Fort sits about 2.5 kilometers from the Taj Mahal and is an emotive prequel to the monument. Therefore, it is ideally best to visit the fort before stepping into the Taj Mahal. There are few moments that take one’s breath away and this was definitely one of them. Photos don’t do the Taj Mahal justice. Seeing it in real life was a majestic and awe-inspiring experience. Its architecture and near perfect symmetry was carefully designed, making it nothing short of exquisite and mathematically clever. Tour guides are available at a negotiable price, and entry is at 1100rs, which is almost nothing if you convert it to the rand value. Sadly, I can’t say much about New Dehli, as our plans were derailed by airport security. From Agra, we took an Uber to Dehli. Our driver skipped every ATM on the road and drove us straight to the airport to draw cab fare. So, we figured we’d store our luggage, spend the day in Dehli and then make it back for our 8pm flight back to Mumbai. As we proceeded to walk out to pay our Uber, security stopped us and refused to let us leave. After much confusion it was made clear that if we left, they would cancel our flights. So, let’s talk about that. Did you know that you cannot enter the airport without a boarding pass? Because of recent security threats, they’ve had to up their security, so once you’re in, you’re in. If you go out, you cannot go back, even if you have forgotten something. People arriving to collect you are permitted to wait for you outside, but may not enter the doors without a boarding pass. I think more countries will soon be using this model of security to maximize safety. It’s one thing to go with the flow, but when it came to booking intercity flights it became stressful as we were unable to purchase tickets online with foreign bank accounts. If you’re in that situation, I’d highly recommend Budgetair.com as a bail out, as they accept South African bank accounts. If possible, prepare for flights beforehand. Road trips are easy to get away with. If you’re going to use Uber, they don’t favour cards, so have cash handy as a means to pay and be prepared for hidden costs such as toll gates and road tax. I think it’s worth it because the scenic intake is a steal. Unless you don’t mind the state of the toilets, I would only recommend train trips for short journeys. If you’re prone to being bitten, this is not the place to take these suckers for granted. You will be the target of every mosquito in your vicinity. I kid you not, guys. If you can spare the expense, try to get those malaria tablets too. Do not take risks when it comes to this. Always keep some spray handy, especially during the evening. If you want to pack light and take things home this is your perfect excuse. You don’t have to worry about clothes in India. There are shops to fit your needs at every corner. I literally packed four items for the trip because I didn’t want to have to stress about baggage. It made the trip so much more fun buying a new outfit for the next day. Most people take an empty bag and just do all their shopping there, since the prices are more than reasonable. Streets in India are not necessarily clean, so wear closed shoes as often as possible. India is one of the most hard working countries in the world. It’s impressive. While we’re having nightcaps, these dedicated citizens are drilling and hustling to make a living. Overall, this trip was an eye-opener. Whether you’re looking to visit short or long term , it is definitely worth seeing the way other people do life. India is a huge country and cannot be explored in just a few weeks, so choose your must-sees and make the most of them to get the best out of your journey. And don’t forget, always keep your camera on hand.